No problems with immigration or customs. The MCC Country Rep picked me up and we took about an hour car ride to east to Jerusalem then south to Bethlehem. There were signs and checkpoints warning Jewish citizens not to pass as it is too dangerous. In reality, it is part of a pr campaign on the part of the Israeli government to keep Israelis and Palestinians as separated as possible. 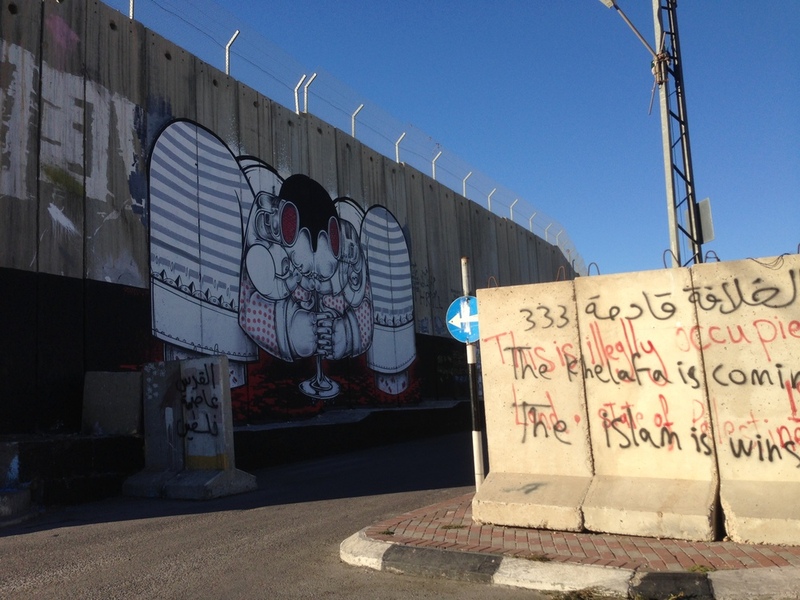 Many Jews have never been to the West Bank and some don't even know a Palestinian. Two main issues that relate to the separation are settlements and the wall. These are both realities that will keep coming up in the days to follow. The West Bank is technically Palestinian territory, but it is being occupied by the Israeli Army. There are groups of people who, although it is against international law, build settlements in Palestinian territory. This is done in the name of security but is an effort to undermine the establishment of a Palestinian state. The settlements are a big deal, because if they continue to be built, eventually it will be impossible to divide a Jewish State from a Palestinian State. There is a huge difference in the quality of life for settlers and Palestinians. The buildings in the settlements are subsidized by the government, have unlimited access to water and services. The Palestinians do not. They cannot even get building permits from the government, and when they build without one, the building is in danger of being bulldozed. The barrier between the two worlds is a security wall. The purpose, again, is security. But in reality it is meant as a tool to demoralize and make life as difficult for Palestinians as possible. If the wall followed the 1949 Green Line, that would be one thing. But it doesn't. It goes into Palestinian territory, often times separating family from family, communities from each other, workers from access to their jobs, and in some instances peoples homes from their ancestral farms. It reminds me of the fence that separates the US from Mexico. The difference is that our wall follows recognized borders. The equivalent would be a Wall between Glendale and Phoenix, but instead of sticking to 43rd Ave (the border of Glendale and Phoenix) it jutted west to include the property of the church and kept anyone on the other side from going to church at Trinity. 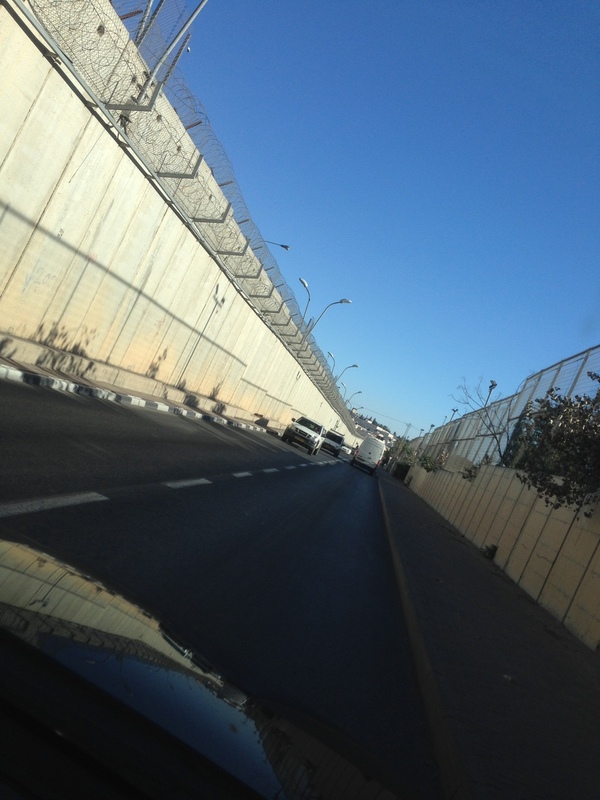 Half of Jerusalem and Bethlehem are behind that wall. I only saw it from the car, but will visit it tomorrow. I met the rest of the group and got settled in. Tomorrow is going to be a big day. We will be visiting a Palestinian refugee camp where people whose ancestors lived in this land prior to 1948, were forcibly removed and have yet to find a place to go. More on that tomorrow. I'm on board my flight to Tel Aviv to join a learning tour with Mennonite Central Committee West Coast. While I have been to the region before (Turkey, Morocco, and Iraq,) I have never been to Israel. To be honest, I have never been all that motivated to visit the "Holy Land." I love to travel, I love history, and the Bible is something of an interest of mine. But my impression of tours to Israel was of large groups of North American middle class Christians getting on and off tour busses taking pictures of places Jesus "walked." It seemed to me that tours like that were taken with an agenda-that the tour guides knew exactly what their customers wanted and gave it to them in abundance. Many of the visitors from the States want to have their evangelical end times theology reinforced. To see the place where Jesus will once again return to earth to smite the wicked and save the faithful. For them, this destination is only a stage upon which some greater apocalyptic drama will be played out, not thinking about how the local inhabitants might feel about such a narrative. I am much more happy with the purpose of this particular trip. Instead of concentrating on how this land will impact American Christians, we are going to listen to the realties for people right there, right now living under the rule of an occupying army. We will listen to Israelis who have significant and legitimate concerns about their security and right to exist. We will listen to people who have been separated from family members and employment by a wall that represents the bifurcation of two separate peoples and cultures trying to live in the same land. My hope is that through listening to these and other stories of people who are affected in a variety of ways, we all might come to understand the complexities of the struggle for peace in Israel/Palestine. As my new friend Jon Huckins says, "Peace making is on the cutting edge of discipleship." I am excited to learn more about this from those who are on the ground, in areas of conflict, working as peacemakers.